Lisa, a mum desperate to give her son a little brother, is looking to trade embryos with another mum. Doing so, she's wading into legal territory coloured in shades of grey, experts say. Just this week, Lisa's son spotted a pair of young brothers on the street near their home in Bushwick. He turned to his mum with pleading eyes. "When am I going to get a brother?" asked Daniel. The five-year-old kindergartener wants nothing more than a little brother with whom he can share his bedroom, go to soccer games and support his beloved Boston Red Sox. The 37-year-old actress is so desperate to have another son, she is ready to trade her one female embryo - the last embryo she has remaining after multiple rounds of IVF - for the male embryo of a stranger. Lisa has one female embryo left over from rounds of IVF and is willing to trade in for a male embryo. "I'm doing this for my son," she told The Post. "My husband grew up with sisters and wants a boy too. This is the way we want to complete our family." Last Wednesday, Lisa took drastic action, sitting down at her computer and writing a message: "Hello, we have been trying to give my child a sibling for three years . . . we want to complete our family with a son. We have a great quality female embryo. Would you like to consider a trade?" She posted the plea to a number of Facebook support groups for IVF couples - and the outrage was immediate. Although no hateful comments were visible to Lisa, enough people complained to forum moderators that her post was removed from one group's page. 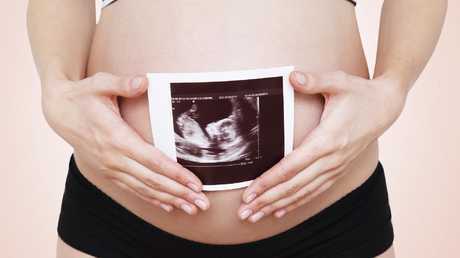 "She already has a toddler, and she has two male embryos left over," said Lisa. "Her husband . . . has six sons from another marriage and then they have a boy together. 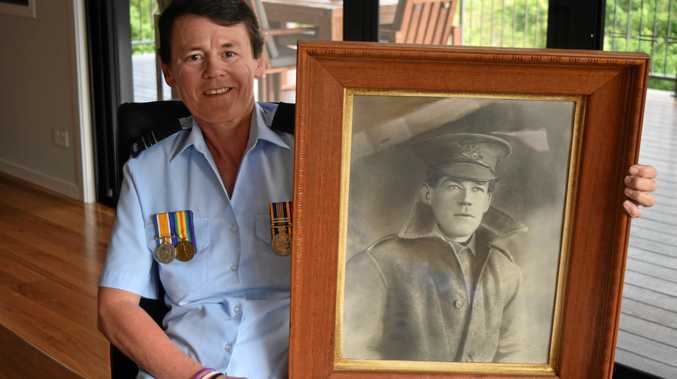 "Her husband said: 'If we are going to go through this again, it's going to be a girl!" 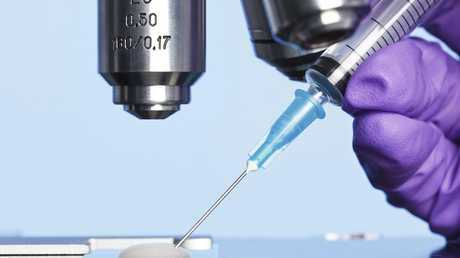 Lisa has exchanged emails with the woman who, like her, is storing the frozen embryo at a fertility centre, and they may well proceed if the woman's husband gives the go-ahead. "It depends whether he is hell-bent on [using] his own DNA," said Lisa. However, she would prefer a local set of parents because she believes the legal side of things would be handled "more easily" in state. Lisa said she would be "open to" keeping in touch with the other family, especially "on a medical basis in case the child needed stem cells or information or even just support." To anyone who questions her judgment, she said: "They aren't walking in my shoes." Lisa and Ray's infertility issues date back to just after their wedding in 2009. Ray, now 48, had been diagnosed with testicular cancer in his twenties, then underwent chemotherapy and radiation, and his sperm wasn't performing as it should. "And I'm like: 'Don't make it any harder on me than it already is.' He has no idea." Around three years ago, Lisa had a succession of transfer attempts where the remaining three frozen embryos didn't take. The family dug into their savings and Lisa's 401k to fund two subsequent rounds of IVF at New Hope. Most of the embryos didn't develop, while others were genetically compromised or failed to implant in her uterus. "I haven't really gotten over it," she admitted. "Since the miscarriage, I've been stuck on a boy. "We've saved all this boy stuff," she added. "Some of it has emotional significance like Daniel's first little snow suit which [looks like] a teddy bear. Then there's the first outfit he came home from the hospital in." Lisa is hoping to have swapped embryos with a stranger before Christmas to complete her family. Picture: iStock. There's also the issue of NYC's high cost of living: "Economically, it makes sense for us to have a boy," Lisa said. "We have a two-bedroom house with no space for a third bedroom. We bought it when Daniel was an infant, and now prices have risen so much in this neighbourhood. There is no way we could afford [a separate bedroom for a girl]. We'd have to move to Nebraska." "I was surprised and sad [it was a girl,]" Lisa recalled. Giving it one last go - for $12,000 - they switched to a clinic upstate and tried again in September, but the egg retrieval yielded no viable candidates. By then, they had shelled out more than $45,000 on fertility services. That's when Lisa and Ray decided to offer up their frozen female embryo, currently in a storage facility for which they pay $1,000 a year, to someone with a male embryo. "I made up my mind as a reaction to losing the $12,000. Now I have a commodity - something I can leverage," said Lisa. She is unfazed by criticisms from people astounded she would give up her biological potential child and raise someone else's, purely because of a gender preference. "It doesn't really matter," she said. "I think if I carry the baby, I would have a bond. I know so many women who have gone through IVF with donor eggs and that's their child. A friend, who is white and Jewish, adopted a black child. That's his son. That bond is unbreakable." Ray and Lisa did consider adoption but were put off by the expense and amount of time a placement takes to process. 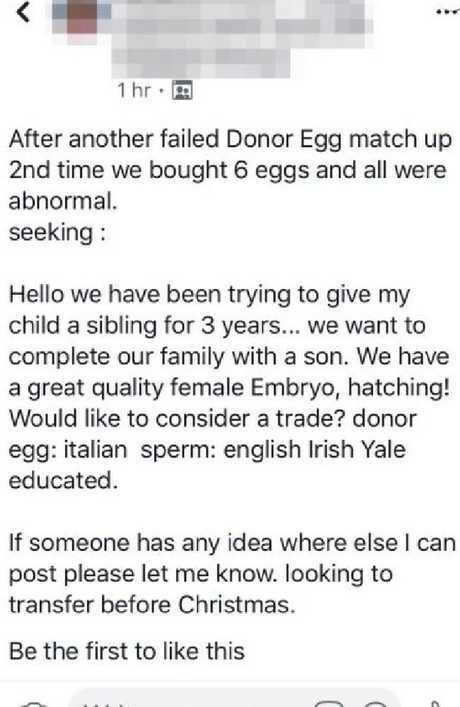 They didn't think it was worth seeking the donation of an embryo rather than a trade because so many desperate couples already do this to no avail. (It is illegal to buy or sell embryos in the US.) An application with the National Embryo Donation Center costs $400, total fees for a donation are around $7,500 and people wait on the list for "years," according to Lisa. When she asked nurses at the upstate clinic whether they knew anyone who wanted to swap embryos, they couldn't reveal any patient information because of HIPAA regulations, but steered her toward Facebook groups as a place to look. In an ideal world, Lisa would obtain a female embryo and be pregnant by Christmas as she doesn't want the age gap between Daniel and the new baby to be too wide. "My husband is Irish/British and I am Italian," she said. "He also went to Yale. When people are looking for donors, one of the first things they ask about is whether they have a degree." She has received inquiries from would-be parents who are eager to take the female embryo, but don't have a male to exchange. "That is not going to work," said Lisa. "We want a boy." This story originally appeared on the NY Post and was republished with permission.